Reason #453 Why Being This Boy's Dad Is Awesome: This Face On My Desk. Daily. You are here: Home / Parenting / Reason #453 Why Being This Boy’s Dad Is Awesome: This Face On My Desk. Daily. I could never count all of the reasons I love being this little boy’s father. I have no idea how it’s possible for my heart to contain this much love, but every day, just when I think it’s impossible to love someone any more than I love this little boy (and my wife) I wake up even more in love than the day before. My heart seriously feels like it’s going to explode it’s so full. 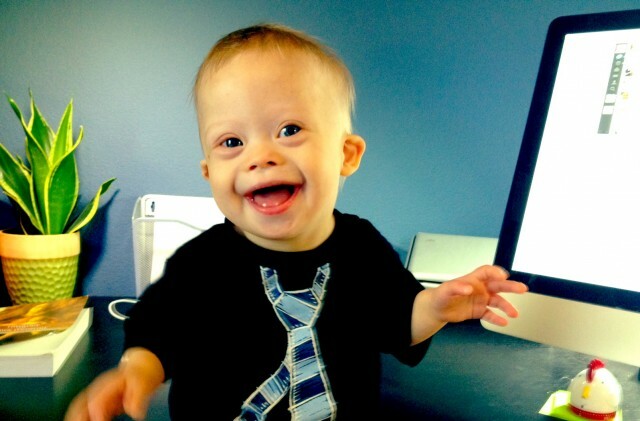 To anyone that thinks raising a child with Down syndrome is a ‘sad story,” think again. There’s no sad in this house. Love the new update to the site. I think it’s just a standard them update, but sitll..looks great. He’s growing up fast! Hey thanks man! And yah, I’m using the preview version of Standard 3……Glad you like it. I really like how it looks on a mobile device as well. Ok. So THOSE are now my new favorite pictures. Love them!! 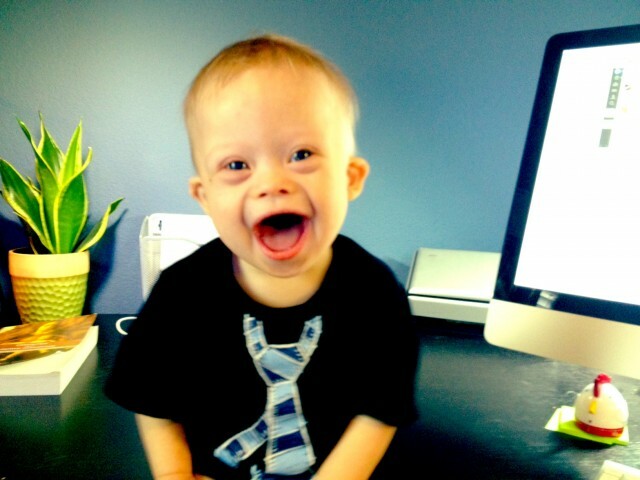 Noah, you are just way to cute for words. 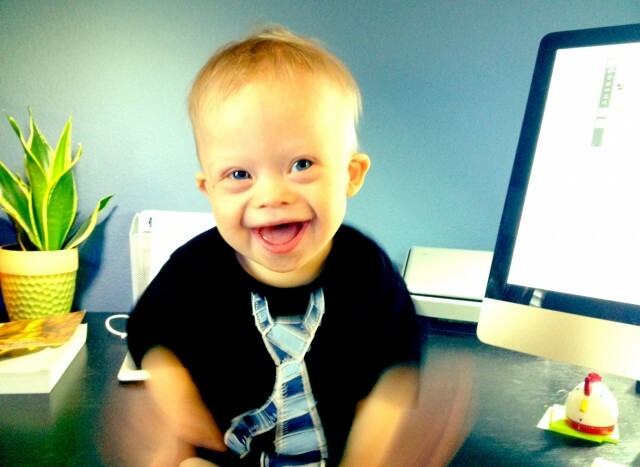 Each time I see a picture of you, I can’t help but smile……..
Love, love, love these pics of Noah…make me smile!! I agree with you 100%. Being a parent is the most awesome experience and it never ceases to amaze me how much I love my kids. Although we’ve been parents for a while now (our oldest of three boys will turn 12 next month), having Tyler 17 months ago has been an extra blessing. His being born with Ds has really, really taught us the importance of living in the moment, and it has been a joy watching him grow and develop. I love my older two boys and I was thrilled when they hit their milestones or learned something new. However, I never worried that they wouldn’t do everything a child was supposed to do, when they were “supposed” to do it, and I don’t think I really appreciated their development and celebrated as fully as I could have. With Tyler, I don’t take anything for granted. We are so proud of every accomplishment, big or small and this has translated into being more aware and more in the moment with our older two boys as well. We’ve been so blessed and I think Tyler’s very existent has taught my husband and I to be better parents to all our kids. My heart is overflowing with love for my three sons. That’s a great idea. He is a great pick-me-upper! It’s so nice to hear you say that…I feel the same way about our little Noah. I wouldn’t want him any other way, he is absolutely perfect!!! God definitely knew what our family’s needed when he gave us our precious boys. I really enjoy reading your posts and blogs, you and Noah are truly inspiring! @facebook-1678942649:disqus Thanks for the kind words. We are just trying to love on our son the best way we know how. Glad to be on this journey with you. @facebook-1678942649:disqus Thanks! It’s so much fun getting to be on this journey with so many other parents who have children the same age as Noah. We live in Park Hills MO. Where are you guys from? Your little guy is adorable! What a light in his eyes! He clearly loves you as much as you love him! oh he is so precious. seems like the happiest baby around! I love Noah too! My Billy is 56. I just dropped him off at the grocery store where he works. I heard all the “Hi Billy” shouts, saw his acknowledging smile, and fell more in love with him. See his smile at http://www.grownmannow.com. Thanks for the joy you spread. Thanks for the kind words, and for sharing your website! Where are you guys from by the way? We live in Kingsport TN. I want to tell all the young parents how fortunate they are to have such good services. We had no help at all when Billy was born in 1956. He changed the course of my life (in a positive way). I would love to send you a copy of my memoir Grown Man Now. Can you email me your address? Hi Noah! I think that you and my daughter Kira could be good friends! These pictures are adorable. They remind me so much of my son when he was that age. He is now 15 and the greatest kid in the world. I have a nephew with DS. he is 20 years old. the pictures are so cute.you are so blessed.THANKS! for sharing. I totally agree! My heart is exploding everyday. It is all about the love. 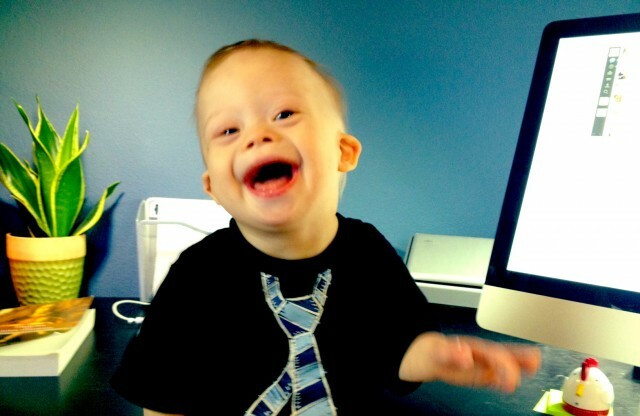 I have a gorgeous 6 year old son named Liam with Up Syndrome like Noah. Oh! This brought happy tear to my eyes! Thanks for the kind words! Do you have any children?